There is no stopping of popular dancer Sapna Choudhary as she enters in the digital world. Sapna brings a new project – a Haryanvi web series ‘Chachi Ram Ram’. On April 13, the makers of Chachi Ram Ram wished everyone Happy Baisakhi by sharing the first ever song promo of the show which is likely to premiere in the coming months of 2019. Though Sapna Choudhary was missing from the 3:17 minutes promo song, but Neelam Choudhary’ who plays chachi is grabbing all the eyes. The promo song ‘Chachi Ram Ram’ is uploaded by music label Royal Music Factory on YouTube. The song has garnered over 2 lakh views so far. Sung by Ankit, Farista and Shubham, the music is given by Riyaazi. Lyrics of ‘Chachi Ram Ram’ song are written by Aamin Barodi. The web series ‘Chachi Ram Ram’ will feature Karan Mirza, Naveen Naru, Joginder Kundu, Shikha Raghav, Ramphal Brothers, Keshav Jangra, Rambir Aryan, Shivani Attri, Poornima, Surya, Amit, Sahil Bajwan in the supporting role. Helmed by Farista, Chachi Ram Ram is bankrolled by Jyoti Mishra. 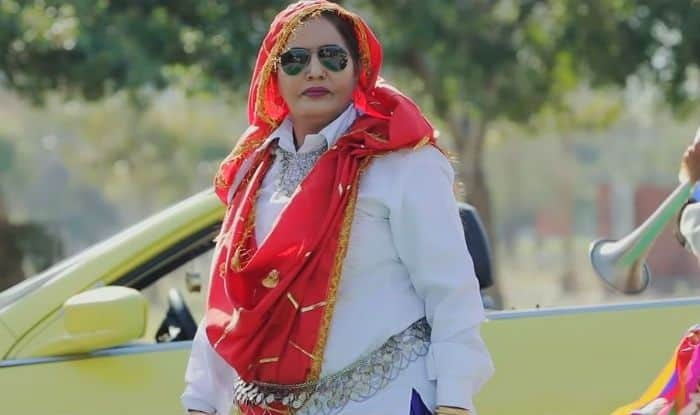 In January, Sapna Choudhary’s fan page shared her latest photoshoot video with on-screen mother Neelam Attri for Chachi Ram Ram. In a green Indian attire with black shades, Sapna’s look simply took our breath while Choudhary’s mother looks beautiful in the traditional outfit of Haryana. In the video, mother-daughter duo is having a gala time at the sets of Chachi Ram Ram. Sapna is busy with her work as she is doing back-to-back stage shows. She even shares her performance with her fans and keep them updated.